AUTHOR INFORMATION: Kari A. Stewart has a BA in English with an emphasis in Literature from William Jewell College. She lives in Missouri with her family and is the author of the Jesse James Dawson series. OFFICIAL BOOK BLURB: Jesse James Dawson was once an ordinary man until he discovered that demons were real, and fighting them meant putting his own soul on the line. His new case is a beauty: Gretchen Keene, a Hollywood starlet who's become an unwitting catalyst in an all-out demon war. It's not her soul Jesse needs to protect, but the two-hundred-and-seventy-six others she's carting around--all the souls sold to spend just one night with the blonde bombshell. That's a lot of baggage, although it might explain her meteoric rise to fame. And it's all up for grabs by the demon world. FORMAT/INFO: A Wolf At the Door is 304 pages long divided over twenty chapters. Narration is in the first-person, exclusively via Jesse James Dawson. The plot is self-contained, but contains a few significant spoilers for anyone who has not read the first two books. August 7, 2012 marks the North American Mass Market Paperback publication of A Wolf At the Door via Roc. ANALYSIS: The Jesse James Dawson series is one of my favorite urban fantasy series since its start in 2010. The series features a world wherein human champions must fight demons for the souls of errant humans; Jesse James Dawson is one such champion who thinks much less of his role and more of his family. In the previous two books, the reader learns more about the world and the role of champions. Arguably the readers have also gotten a look into Jesse’s life and the issues that have cropped up due to him being a champion and a good guy who will not stand back and let evil run its course. The review ahead will contain minor spoilers for the preceding titles so readers be warned, if you haven’t read beyond book I, this is where we say good bye. Welcome back those of you that have read the previous two titles. The story opens up after the horrific events of A Shot In The Dark (book II), Jesse James was able to save himself, his friends and defeat the demon that had haunted his dreams for a long time. Though he was victorious, the cost of victory has been too high for him, his friends have been exposed to his lifestyle and are now reticent around him, his so-called Champion mentor (of sorts) was found to be hiding certain important facts from him and lastly the demon Axel who has been tailing him so far might not be all that bad. All of the events of the previous book have left Jesse unsettled about what he truly needs to do. To add to that, he’s approached by Axel to repay him for the favor done to save his friends. So Jesse has to pack his bags and move to Hollywood to protect a star, who has got quite a soul contract to her name. Trouble starts soon enough and Jesse will have to draw upon all his deductive skills together to figure out who is screwing whom and what’s truly Axel’s angle. After the horror-induced events of the second book, it was a welcome back to the procedural feel of the story. Even thought the location was once again is a new one, in this case Los Angeles. The story draws upon the first book’s roots to give us a mystery plot wherein the main protagonist has to deduce and find out the villains as well as save his own skin and that of the damsel. The twist being the hero’s married, not really a detective and the damsel is no damsel and demands no rescue as well. The plot quickly introduces us to this myriad setup wherein Jesse is as uncomfortable as he could be and possibly more clueless about the wants of the demons than he usually is. The deciding factor is also that while he’s sure that Axel’s withholding information from him, his usual font of wisdom, Ivan is also closed to him by Jesse’s own choice. His target Gretchen Keene seems to be a person from whom he could care less, however he has to protect her and thus wither her scorn as well the Hollywood way of life that befits Gretchen. The plot pace once again is a striking feature as the author quickly lays out a mystery laced storyline and then gives the reader a strong plot-thread to follow while surprising the reader with her twists and world secret revelations. The story also is liberally laced with humor following on from the previous two books and has a running joke about Jesse being confused for one of the breakout stars from the TV show LOST. The mystery thread falters in the climax to a certain degree as many readers will be able to figure out who might be behind some of the happenings but the author does her level best to lay up some zingers in relation to the future of the books to keep readers from being too bored. Characterization is sharp as ever and with Jesse being the smart mouth that he is, the readers get quite a mid-western outlook on the happenings of Los Angeles. The narrative strength of the books is what raises the bar for this series and elevates it from the mundane crowd. Jesse isn’t just a guy with a mean streak, he might be curmudgeonly from time to time, but the reader knows that at heart he’s one of the good guys. In first person narratives, the character voice has to be strong, unique and evocative for the readers to be attached and similar to most of the successful ones like Harry Dresden, Kate Daniels and Atticus O’Sullivan, Jesse James Dawson makes this cut with more than enough room to spare. I can’t get enough of his dry wit, old school appearance and honor; this distinct narrative voice is one that will surely resonate with many lovers of the Urban Fantasy sub genre. The only drawback in this entire book for me was the predictability about the villain’s identity in the climax but inspite of its predictability factor the author does good on the climax that has a quite a twist to it. For regular mystery-thriller readers, it might be easy to figure out the twist regarding the villain’s identity but not the reasons behind the villain’s presence. This was the only thing, which I thought pulled the book back a bit and mostly shouldn't be a big turn-off factor for most readers. CONCLUSION: Jeese James Dawson is a character literally and figuratively and one that is admirably sketched out by Kari Stewart. Drawing on certain parallels from her hero Jim Butcher, she infuses the story with enough, charm, humor and action to keep the readers entertained while charting her own path in this crowded subgenre. If you enjoy reading the Dresden files this you might like to read this book, if you like a witty protagonist then this book won’t disappoint, if you like urban fantasy procedurals then you can’t wrong over here. Simply put this is a well-written book for readers who are looking to be entertained and on the lookout for the next best author to follow. 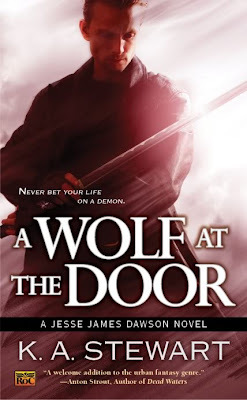 NOTE: The author has also written a short story set in Jesse James Dawson universe that will be published on 7th August (Tuesday) at Tynga's Reviews as part of their Paranormal Summer Camp multi-author event. The story will not feature Jesse as its narrator but someone else and is set between Books II & III. So keep an eye out for it next week. I think you will enjoy it. Its ending portends many tumultuous things for the future books.